The lovely bouquets of mixed flowers can be found in the Marche aux Fleurs, the flower market at Cours Saleya in the Old Town of Nice, Provence in France. When visiting Nice in Provence, France one of the 'must-see' places to visit is the Vielle Ville, the Old Town, where you will find the Cours Saleya, most famous outdoor market in the city. The Marche aux Fleurs, the flower market at the Cours Saleya is a bustling and exciting place, the lovely bouquets of mixed flowers arrayed on the many stalls are a delight for the eyes, and of course, the aroma is fabulous. Lilies, daisies, carnations, marigolds, baby's breath are just a few of the blossoms shown in this photo - but the flower market at Cours Saleya in the Old Town of Nice have all kinds of plants from asters to zinnias. 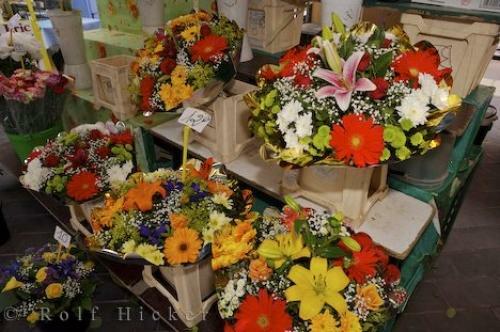 There are the bouquets of cut flowers as well as potted plants for sale - something to satisfy all tastes. Photo of bouquets of mixed flowers at the Cours Saleya in Old Town, Nice in Provence, France in Europe. ... m. to 5.30 p.m. and 8 a.m. to around 2 p.m. on Sundays during the summer. In the winter the hours are shortened to 8 a.m. to 2 p.m. as the flowers are not as plentiful then. However, even if the flowers are in short supply, the Cours Saleya market still has delicious fruit, vegetables, cheeses and meats for sale. Bouquets of flowers at the markets, Cours Saleya in Old Town Nice, Provence, Cote d'Azur, France, Europe. I photographed this photo with the digital SLR camera model Canon EOS-1Ds Mark II, aperture of f/6.3, exposure time of 1/60 sec. on ISO 100, as always I used a original Canon Lens, the focus lenght for this picture was 24mm.